This post was written for inclusion in the monthly Carnival of Natural Parenting hosted by Hobo Mama and Code Name: Mama. 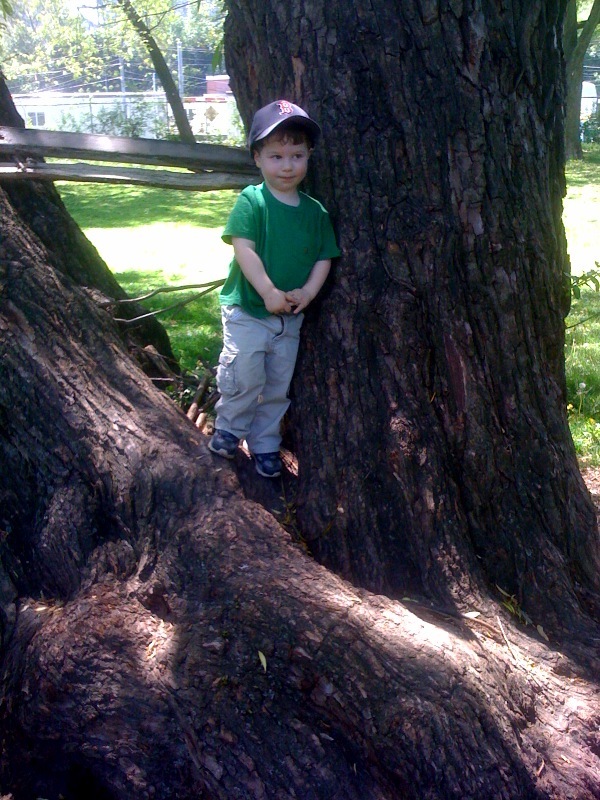 This month our participants have shared their stories and tips for playing outside with kids. Please read to the end to find a list of links to the other carnival participants. We moved into our townhouse about 4 years ago. It is in a great location – really central, close to downtown and the subway, and within walking distance of lots of great restaurants and shopping. All of these factors were really important to us when we purchased our house. At that time my husband Jake and I were both working at law firms downtown and were really busy. We didn’t have time for gardening or shovelling snow – convenience was really important to us! Fast forward to now – my husband works mainly from home and I work out in the suburbs and we have a two year old son with boundless energy. Our house is still great – we have enough room and we still love the urban location. There is only one thing missing – and that is a backyard! We often think about how nice it would be to have a backyard where Dylan could burn off some of his energy – perhaps with a swingset and a kiddie pool. It’s not in the cards for us to move right now for a variety of different reasons. But it’s still important to us that Dylan has lots of time outdoors. We are lucky that we live in walking distance of two amazing parks. Both contain great jungle gyms geared to kids in Dylan’s age group. Both even contain splash pads for those hot humid Toronto summer days. Whenever we take Dylan to the park, we all have a great time. He often finds other kids his age to play with. Jake and I also enjoy the fresh air and the chance to be away from all of our distractions at home – our laptops, cooking, cleaning, etc. In addition to the parks, we live quite close to an amazing walking/biking trail. Dylan calls it the “forest”. We love to go for walks in the “forest” and now that Dylan has a tricycle, it’s a great place for him to ride without the worry of cars. In the summer, we spend lots of time outdoors at our family cottages. Dylan can play with his older cousins in the sand and the lake for hours. There are wide open spaces for Dylan to run around and we all enjoy the clean country air. So even though I sometimes feel wistful that Dylan doesn’t have a backyard at home, I think about all the amazing outdoor spaces within walking distance of our house. I’m an urban girl at heart, and although perhaps someday it will make sense for us to move to suburbia, right now all the benefits of city life outweigh the drawbacks. Even though we live in an urban area, we still spend lots of time outdoors right near our house, and the fact that we spend many long weekends at the cottage means Dylan isn’t lacking at all for outdoor play. summer fun… — Mandy at Living Peacefully with Children is looking forward to spending the summer outside with her children the way she used to spend summers with her mother. Digging, Tree Climbing and Puddle Jumping — Laura at Laura’s Blog bemoans the loss of her girls’ climbing tree but knows they’ll find something else just as naturally tempting. Think Outside the Easel for Summertime Fun — Acacia at Be Present Mama finds several ways to bring art fun to the outdoors. Outdoor Learning in our Urban Environment — Andrea at Ella-Bean & Co. has found ways to get grass between her daughter’s toes, even in the city. Categories: Play | Tags: Play, toddler activities | Permalink. We are in the opposite situation – we have a huge backyard, but there is nothing else for us to do outside within walking distance. While our yard is wonderful (I’m not complaining, really! ), it can get old looking at the same things day in and day out. We don’t even have sidewalks in our neighborhood for me to feel safe letting Kieran ride around on. I do need to concentrate more on taking him (by car) to more parks with room to roam and a change of scenery – maybe the monotony is one of the reasons he sometimes resists going out. Do you have any kind of balcony? I totally embraced the balcony living at our last place and put a tiny slide out there and lights and bubbles and a ball. But even without it, I think there are so many great things about living in an urban environment: the city is your backyard! Vive le parks! We do have a patio on our third floor. It’s pretty big actually but it is soooooo hot and sunny and we often have a bee problem. Maybe I should look into getting an umbrella and a slide outside….good idea! Having a backyard is nice to have, but definitely not essential. Even though we do have a yard, we often head down to the neighbourhood park instead of playing in the back. The park has better play equipment, more space, and most importantly, lots of other kids! We do like the social aspect of the park. It’s interesting to hear how so many people with backyards still make good use of local parks. We recently moved into an apartment, so I can relate to not having a back yard. However, we actually have so much landscaping around the apartment complex that there is plenty to explore outside our front door. More rocks and sticks and lizards and bugs than my 2 year old knows what to do with! There are parks driving distance, and we definitely take advantage of them in the early hours before it gets too hot. We just found an apartment building nearby with amazing fountains outside…they captivated Dylan for almost an hour tonight. So there are definitely great things about apartments and their outdoor spaces. We live in a very urban area too, but unfortunately one where it’s not safe for us to visit the nearby parks (there are frequently shootings) so we are moving to the suburbs! How great that you have two parks and the trails all so close and safe to use! I know…we are very lucky! I need to focus on all the great things that our location offers us! It’s great that you have such fantastic outdoor spaces to go on adventures in! As someone with a big backyard I can get a bit on the lazy side in terms of making the most of what we have close by. But you’ve inspired me to make more of an effort – because as you say – it’s wonderful to get away from the phone/computer/distractions at home and get out amongst it! But fortunately we also live by so many parks and natural beauty, and we try to use the outdoors to our advantage every day. My husband and I are not naturally outdoorsy, let’s-go-outside-each-day people, but having a toddler made us that way! He absolutely needs to burn off energy and get fresh air, daily.